A world premiere play in verse about a transgender hero. 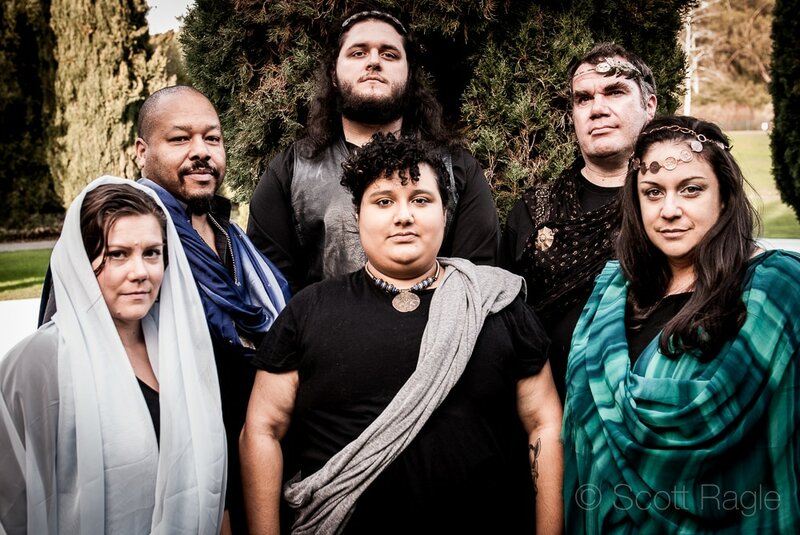 Caeneus and Poseidon is a new play inspired by a transgender figure from Greek mythology and originally written for the 2012 San Francisco Olympians Festival. Come be a part of this exciting new theatrical experience that blends the classical and the contemporary. ​​Caeneus begins his life as Caenis, assigned female at birth. After the sea-god Poseidon grants his wish for a new body, Caenis - now Caeneus - feels compelled to hide his former identity from all but his closest friend, Hippodamia, as he seeks the acceptance of his kinsmen and community. But as he and Hippodamia begin a relationship that challenges their society’s strict social order, and as a vengeful Poseidon works behind the scenes to bring about Caeneus’ downfall, the young man must find the strength to openly embrace his identity and his past. JOIN US FOR OUR SPECIAL EVENTS! On Saturday, March 11, it's all about Greek mythology! Sample Greek snacks and come dressed up as your favorite character from mythology (Greek or otherwise - feel free to let other mythologies inspire you too) for a chance to win a prize in our costume contest. Then join us pre-show for a talk by Bay Area playwright and director Stuart Bousel, founder of the San Francisco Olympians Festival, about the mythology behind the characters of Caeneus and Poseidon. Playwright Bridgette Dutta Portman will also discuss how the play both borrows from and departs from the original myth. Show up at 7 pm for the costume contest; talk begins at 7:30. Get tickets. Join us post-show on Sunday, March 19, for a talk-back with the directors, playwright and cast of Caeneus and Poseidon. Hear about the inspiration behind the play and the rewards and challenges of staging a new play that blends the classic and the contemporary. Get tickets. ​Join us following the matinee performance on Sunday, March 26, for a panel discussion on gender identity and what it means to be transgender, genderfluid or nonbinary in today’s society. Speakers include Trans Lifeline cofounder and Executive Director Greta Gustava Martela, actor Nicky Martinez, and actor and radio host Roman Rimer. Moderated by Dr. KJ Cerankowski of Stanford University. Twenty percent of box office proceeds from today’s show will be donated to Trans Lifeline, a nonprofit organization dedicated to helping transgender people in crisis. Get tickets. ​Caeneus and Poseidon is coproduced by Bridgette Dutta Portman, Wm. Diedrick Razo, Patrick Moyroud, and Dragon 2nd Stages, and directed by Amy Crumpacker and Wm. Diedrick Razo. To learn more about the myth that inspired the play, learn about our cast and production team, see photos and read blog entries, please follow the links above. We hope to see you at the show!